Mondays 9.30 – 10.45 a.m.
Mondays 6.30 – 7.45 p.m. The hatha yoga I teach is influenced by Vanda Scaravelli’s approach to yoga. This style of yoga approaches the same asanas (postures) as hatha yoga but with much more emphasis on how your individual body needs to approach such poses. Time is taken to ‘undo’, so releasing physical and mental tension with particular focus on the breath and gravity before building on postures. Cost per class: £15.00 Or £72.00 for 6 consecutive classes in advance. 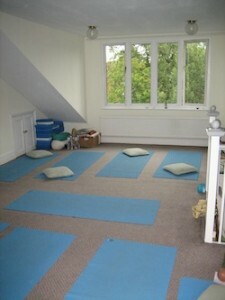 Summer term Monday 13th May – 8th July 8 classes £96.00. There will be no class on the morning of the 17th June or the Bank Holiday Monday 27th May 2019. I am a registered and insured practitioner for all aspects of my work and have over 20 years experience of bodywork as a Shiatsu Practitioner and 15 years as a Yoga Teacher and Doula. Kathleen offers one to one Yoga sessions, specifically addressing Back/NeckShoulder related problems. Women’s Health, Vitality & Wellbeing. From Menses – Menopause i.e. painful periods, anxiety, fertility issues, pregnancy, postnatal recovery, pelvic floor weakness, and perimenopausal symptoms. Men’s health, pelvic floor and prostrate related issues. Sessions last 1 hour. Cost £ 45.00 to discuss or book call or e-mail me. Concessions are available on request for all treatments/classes. For more details on any of the above e-mail or telephone Kathleen direct.